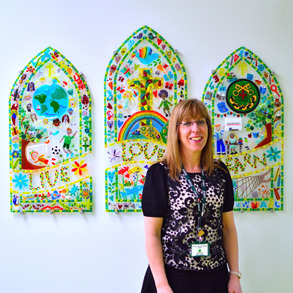 My name is Mrs Carol Baron and I am the very proud Headteacher of this great school. First and foremost, we are a learning in faith community, where Jesus is at the centre of all we are, all we say and all we do. Our Catholic ethos brings all in our community together so that we are equal partners in educating our children spiritually, morally, socially and culturally. Our success lies in our strong partnership with parents who are incredibly supportive of our school and in the fantastic staff and Governing Body teams who are fully committed to ensuring that all children receive quality first teaching and learning in an exciting and enriching learning environment. I hope that you will enjoy looking at our website and that, in reading the wide range of material available and looking at the many wonderful images, you will get a good flavour of our happy and exciting school. If you would like a paper copy of any on the information on our school website then please contact the school office. Thank you. Please check these sources before phoning school. Thank you. Click here for more information on OPAL (Outdoor Play and Learning) at our school.